Here are some pictures of the Pop-Up cards the 5 year old artists in Berlin made for their friends in Mooste. Their teacher, Lusine Boyajyan said, "The kids liked them so much that they made some cards for mummies and family :)." And the love continues! The Mice and The Tigers met up online to sing 'We Wish You a Merry Christmas' together! Pop Up Tigers and Pop Up Season's Greetings! Once The Tigers mastered the art of making a pop up box everything became possible! Nachu was experimenting with writing her name in cursive. Jonatan made a pop up reindeer. Sreya said she wanted to give the sun to her friends in Vietnam. That's so thoughtful considering Finland could really use some right about now :). 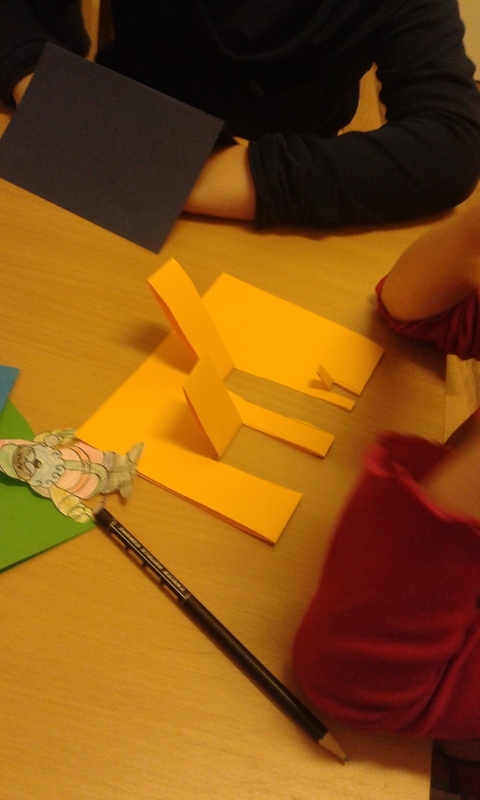 Ida went beyond the twofold card and made a pop up book! The Tigers will mail these warm wishes to the Mice in Vietnam. Hyvää Joulua and Happy New Year! The last session in Meilahti started off a bit differently than the others before it. I had a special guest: Arlene, the founder of Dear You workshops was there with me to tell about her latest installation piece. So we plunged to the world of installations and scratched the surface of performance art with a seasoned guide. The outcome of the workshop was creative as always! We got a taste of Du Champ -style piece called Pen on the Floor, a miniature Pollock, Magic tricks of expectations, surprise performative art and framings and of course the Illuminati had it's hands on this workshop too. We discovered that art is dialogue, a process where we interpret each other. Sometimes we get the gist of things and sometimes we get lost in translation but that's okay. No matter the distance we can always try to reach out to understand and find our horizons being broadened in the process. It's art when you call and treat is as such! Using some of the words that the Dear You Artist in Meilahti mentioned, all in all we had a fun, new and magical ride on our Dear You journey! All That Talent for Christmas! Do you know how to play the guitar, do the baby freeze or do you just know really much about ice hockey? I surely don't but the talented fifth graders in Helsinki English School know! This time at The English School we looked at our gifts. We pondered about how can we give them as presents to our friends. The word present has two meanings: one is something you give away and the other one is something you receive right at every moment, at the present. So a gift in it's most heartfelt way is you being present to the people around you. That means everyone of us can give a special gifts this Christmas by just being present and using the talents we have. Some of us had a hard time seeing our own talent. But we needn't worry too much! Help was always near when friends cheered on at how good someone was at so many things. Sometimes we can't see our own talents because to us they're just everyday things while to others they might be a wonder. If you know how to do something really well, you might just need a reminder now and again from your friends on how good you actually are! We drew our talents in the stars that we sent to Prague and hope that they'll bring at least as much cheer there as we experienced when making them. This gift giving doesn't have to stop at Christmas. We can all use our gifts and talents, no matter how small we think they are, every day and bring cheer and ease to others around us. Let's have a gift filled Christmas and a talented new year! We have Christmas Holidays now and have been busy organizing happenings, presents and so on here in Vantaa, Finland. Thank you Simone and kids for your lovely posts. The kids got all those drawings you made!! They were so grateful and happy about that! This week we made a little surprise for your Christmas ... hope you will get it soon! And there are also pics from our Party Room. We had a Winter theme where everyone could use their 5 senses. Beautiful holidays to you all and Merry Christmas. Last workshop of this year was also my last contribution to this project. As you could sense all around the Panda Learning Center, Christmas are everywhere and I wanted to set up the workshop in this mood. I wanted to create a calm and peaceful atmosphere and to have time to chat with the students. This time we used just markers, scissors and blank white A4 paper. During the workshop we talked about Christmas time and what we would like to give to the students from Finland, which was really fun and I hope that you are going to see it soon. The biggest source for us was the licorice world, which we all remember from one of the the previous workshop in which we received pictures of licorice candies from Finland. In the end, I especially wanted to thank my students for their intense attitude and high quality outcomes, also thanks to stuff of Panda Learning Center for providing me warm words and lunch, students from Finland for their funny letters and last but not least to Arlene Tucker coordinator of this project for patience and trust to give me space and time within Dear You project. A Message from Moonstone Pop Up Pros! We had a great time with this project. We practiced the day before we made the cards and now we are all pop up pros! One boy told me he couldn't wait to teach his older brother how to do this! I will be sending them out tomorrow morning. I'm sending you the first pictures of our music-project. It was interesting to notice that nearly all children had the same feelings. Morning mood is smooth and clear. A lot of them started to paint with the colour green; they painted nature and "good" things like music, birds - happiness and peace. Vivaldi's Thunderstorm is very rude and disturbing. They had the feeling of death and threat in different forms like a house is burning or someone is crying for help. Also, bad people are in the pictures. *The artists in Vienna, Austria are exchanging with the artists in Vantaa, Finland. Kita Felix and Friends in Berlin, Germany have been busy (as you can see) making a sweet package for their friends in Estonia! Lusine, the teacher at Kita Felix and Friends in Berlin said, "the kids had a lot of fun, many painted with music, letting the beat be the guiding light." I'm sure their friends in Lasteaed Illikuku in Põlvamaa, Estonia are super excited to receive their musical paintings! The Musical Dears from Vantaa! We have had so much fun and a nice time with our Dear You Art project and music paintings/drawings this week! Our kids listened in their own "small groups" different kind of music from Finnish classical to folk (specially our own national instrument Kantele) and world music (pop) between. And surely they were enjoying a lot also listening in peace while making "pictures". Finally, they finished their work to an end. We discussed different kinds of feelings we had. Children mostly told about feeling happiness, joy, pleasure, good and positive emotions and their being safe! Some had exciting feels and also little bit scary too or at least mystic:... "like some big ship by the sea without knowing what is coming next..." All of them said they could do this again, it was so fun! Hopefully you have received our big candy present for your kids in Vienna? For the November Musical Painting Michelle Mullally, Assistant Director at Moonstone Preschool said, "They got so into it. I love seeing how students respond to music while making art." This time at Central Point International Elementary School in Prague we made a visualization of the music project. I prepared for the students a long sheet of paper and than while we altogether were listening to music, we tried to express what we heard. The aim was not to create separate individual results of our observations, but we wanted to get closer to the idea of listening together and also creating together. That is why we used this kind of paper. All the students at some point disturbed each other's drawing and had to deal with each other's drawing space, which brought new element into our working method. Hopefully our friend school in Helsinki will recognize the energy locked into the piece. Art is another form of self expression and today the Tigers taught me a lot about that! We started the session by looking at artists such as Paul Klee and Wassily Kandinsky. These two great artists were very much inspired by music. We talked about the kinds of sounds and music we started to hear when we looked at their paintings. Vasily Kandinsky (1866–1944). Composition 8 (Komposition 8), July 1923. Oil on canvas, 55 1/8 x 79 1/8 inches (140 x 201 cm). Solomon R. Guggenheim Museum. Then we listened to some music and hopped along to it to see visually and physically how the rhythm is. We jumped when the tune was high and crept closer to the floor when it was low. After we felt comfortable with the music we shimmied to our drawing tables and started painting away to Schneider TM's song called "Frogtoise" and to Nightmares On Wax song, "Les Nuits". Can you hear the difference through the brushstrokes? We can't wait to hear what songs our friends in Vietnam created to! Mice wonder, "Candy can be black?!" Greetings once again from our Finnish Vietnamese group, Tigers and Mice enjoyed last week to the fullest knowing that Halloween was around the corner and they had a terrifying candy bag full of their favorite sweets. Here in Hanoi, we decorated our bags with different shapes and used our imagination and some music to decorate the candy bags, they turned out scary and colorful at the same time! Last Friday was our international show and tell circle, we shared candies, jellies, lollipops, marshmallows, and even pancakes and ice cream. We even had a girl that loved flowers so much that thought it would be nice to have them in her candy bag. - Hahahaha, no its something we call liquorish. - Is it black candy? Ewwwww! Apparently some colors are not meant for candy if you ask our little mice! Black is definitely one of them... Hopefully they get to taste that Finnish delicatessen one day! See you next month Dear you Community and have a nice autumn were ever you are!